Hello and welcome to Day 5 of the My Favorite Things November release countdown! For the next five days we're counting down to the November release and sharing cards and projects using all of the new stamps and die-namics. 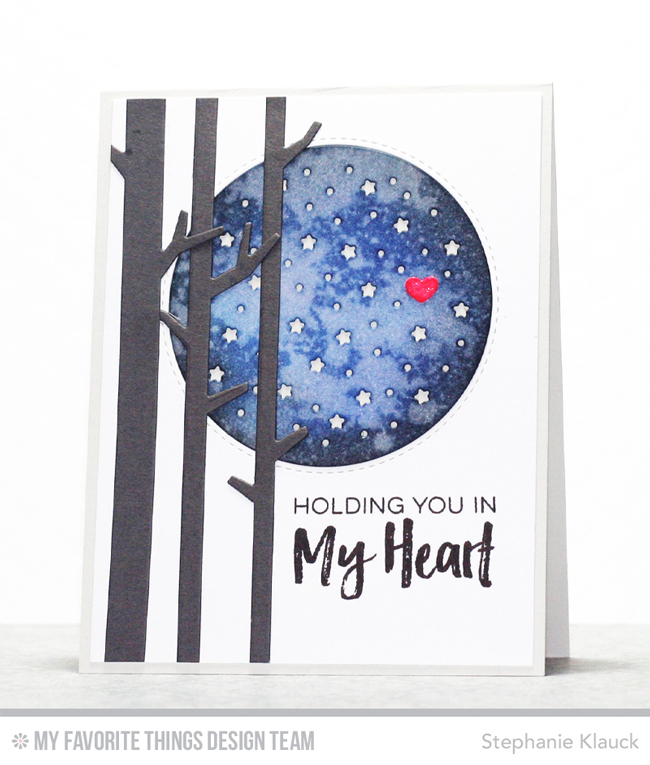 For my card today, I used the new Starry Circle die-namics and the new Solid Birch Trees die-namics together with the Deepest Sympathy stamp set (coming later this week! ), to create a touching, sentimental card design. I diecut the Starry Circle from white card stock and used both the negative and the positive diecuts on my card design. I added Distress inks to the starry circle to make it look like a night sky and then added some spritzes of water to give it a distressed look. I trimmed down the card stock panel so it would fit on a top folding Grout Gray card base with a bit of a border, and then I attached the birch trees (cut from Steel Grey card stock) to the left side and added the starry circle back into the negative space. 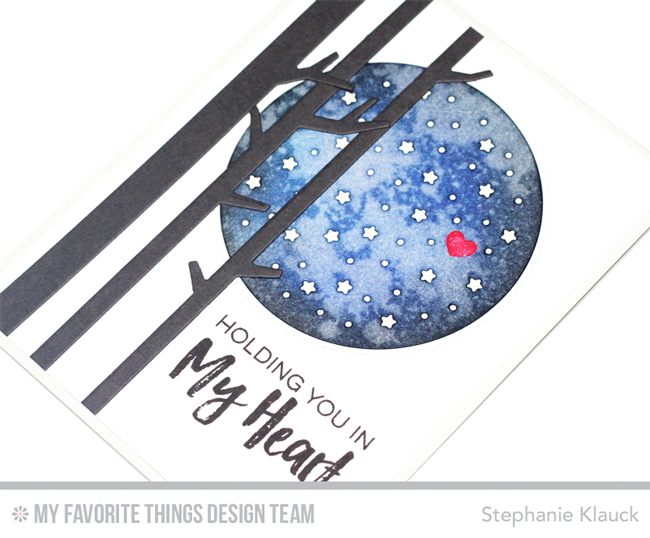 I stamped the sentiment directly on the white card stock panel with Black Licorice dye ink and then I diecut a heart from the Blueprints 29 die-namics, coloured it with red ink and adhered it onto the starry circle. Thanks so much for joining me for day 5 of the MFT November release countdown! All of the new products that we're sharing this week will officially be available in the MFT online store at 10pm EST on November 1, 2016. This is a fabulous design and it is perfectly executed. Lucky the recipient you give this to. That sweet little heart has so much meaning. Love the starry background and the birth. Great card. What a beautiful scene! What a perfect card for you to give to someone special! Thank you for sharing.